Welcome to the 6th in our series of posts that illustrate how libraries deliver against 7 outcomes. You have read about literacy, culture, communities, prosperity and digital, now it is the turn of wellbeing - and how libraries help people lead happier and healthier lives. Councils have a responsibility for their communities’ social wellbeing and for public health. They increasingly focus on preventative work, helping people manage their own health to reduce both the burden on the NHS and health inequalities. Arts Council research contained some interesting conclusions, including “being a regular library user is associated with a 1.4 per cent increase in the likelihood of reporting good general health” and based on the reduced number of visits to GPS resulting from this improvement in health, they predict the medical cost savings associated with library engagement at £1.32 per person per year. They go on to say that it is possible to aggregate NHS cost savings across the library-using English population to estimate an average cost saving of £27.5 million per year. Public Health England (another Taskforce partner) confirms in this blog: Local first: NICE guidance is clear mandate for community approaches to health and wellbeing, that the community plays a valuable role in helping to make this happen. Libraries offer a wide range of health information, both online and through quality-assured reading lists dealing with the more common health conditions. 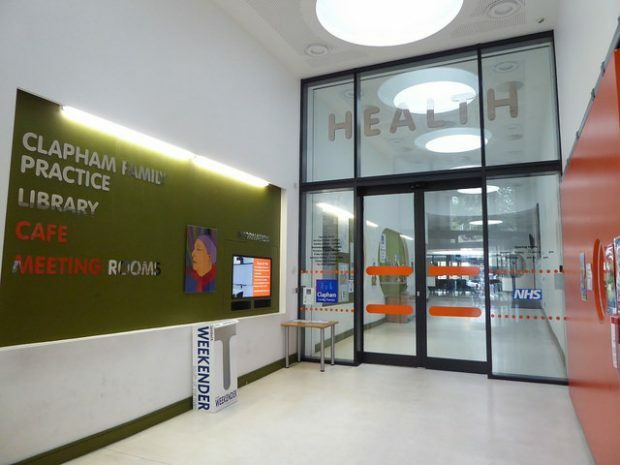 In their role as community hubs, libraries also offer non-clinical spaces in localities where health and wellbeing groups can work with the community in a trusted and non-threatening venue. They’re also places where people can come to meet others. Reducing social isolation is an important issue in the context of improving wellbeing. In a 2013 study, 59% of adults aged over 52 who reported poor health said they felt lonely some of the time or often, compared to 21% of those who said they were in excellent health. A number of research studies suggest there are significant associations between frequent library use and reported wellbeing, and also between improved access to health information through libraries and reduced calls on services such as GPs. The Society of Chief Librarians have created a Universal Health Offer, in partnership with the Reading Agency. It includes a commitment to provide a range of services including public health information and promotion, sign posting and referrals. One of the most visible outputs of this Offer is the Reading Well Books on Prescription scheme. Launched in 2013, it comprises a set of material selected in consultation with health professionals that is available in libraries across the country (read more later in this post) . Read more about the Health offer on their website. There is lots of activity to support this outcome - much of it award winning - and many examples of innovative work going on across the country. I focus here on projects to make libraries more welcoming to people with autism and dementia, and programmes to support those who suffer from dementia. 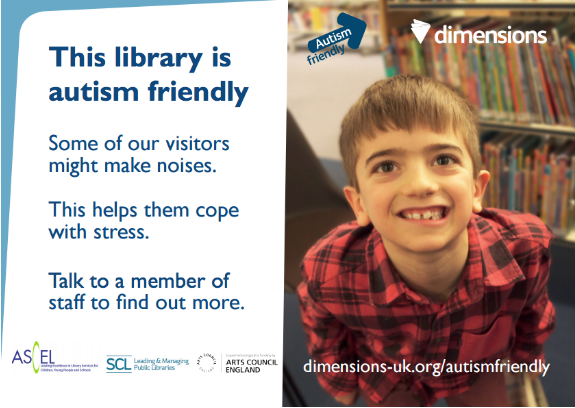 Following research showing that more than 9 in 10 people with autism would use their library more if some autism friendly adjustments were made, the Association of Senior Children’s and Education Librarians (ASCEL) have worked with Dimensions to create a resource pack and guidance, which includes a training video for staff. Their website includes case studies of work done in Chelmsford, and recently added a Google Earth style walk through of Chelmsley Wood Library, produced following Solihull Libraries work with Autism West Midlands (AWM), plus a report that includes examples of good practice in a number of other libraries. Sandal Library in Wakefield received a major internal and external refurbishment in 2015. The interior was redesigned so that people living with dementia would feel comfortable, supported and more independent. 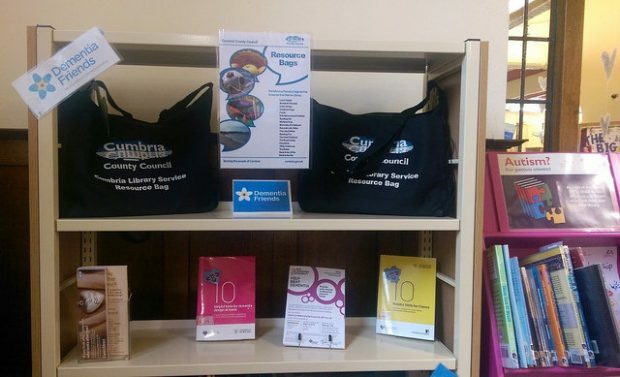 Planned in partnership with the Alzheimer’s Society, Sandal Library became the district’s first dementia friendly public building and is likely to be the first fully dementia friendly library building in the country. Practical things include: a colour scheme which is deep red making it warm, friendly and calming; furniture, such as chairs and sofas, which have a plain design and are easy to get in and out of; a reduction of reflective surfaces; grey skirting boards and door frames making it easier for people to recognise them against the magnolia coloured walls, plus signage and guiding to help people recognise symbols and words. They have published details about these changes in a guide. Since reopening, it has become a beacon of good practice for other authorities, and for health professionals all over the country. Its local community have also enthusiastically supported their new local library and it has become a vibrant hub of community life. Libraries in Kent were 2013 finalists in CILIP’s Libraries Change Lives awards. Their project saw them work in partnership with Alzheimer’s Society, Dementia UK, Age Concern and others, to help people living with dementia and their carers. Elements of the programme include their ‘Read Aloud’ and ‘Pictures to Share’ sessions, helping to stimulate memory and provide enjoyment. They have worked with Kent Gateways to develop a substantial library offer, to provide information and signposting, to train staff and volunteers and to raise awareness of dementia in Kent and beyond. Reading Well is a scheme developed by The Reading Agency and the Society of Chief Librarians, delivered by the majority of libraries across the country. It contains two strands: Books on Prescription, and Mood Boosting books, and it is rare to visit a library without seeing displays of books recommended by one or both. Books on Prescription suggests books, selected by health professionals and experts by experience, and endorsed by health organisations, which provide helpful information and step-by-step self-help techniques for managing a variety of conditions. There are three book lists available: Reading Well Books on Prescription for common mental health conditions, Reading Well Books on Prescription for dementia and Reading Well for young people. The evidence base for Reading Well Books on Prescription can be found on this site. The Reading Agency lists material from National Institute for Care and Excellence, and a wide range of published research, including some specifically into the Books on Prescription model, plus more general research on bibliotherapy. The majority of users of both schemes are self-referring, rather than being signposted by a health professional, although a higher proportion than previously (27%) are being referred. This route has increased since year one (20%). Reading Well Mood Boosting Books is a national promotion of uplifting titles, including novels, poetry and non-fiction. The books are not prescribed, endorsed or recommended by health professionals, but are all recommended by readers and reading groups. The Reading Agency has also worked in collaboration with Macmillan Cancer Support to produce book lists recommended by people who have been diagnosed with cancer. An example of one of the many programmes which aim to support both people who have dementia, and their carers, is Make Friends with a Book, run by Gloucestershire libraries. During these sessions, group members are encouraged to listen, share and read poems. Poetry seems to stimulate a part of the brain that enables participants to read perfectly. Gloucestershire have been working in partnership with the Alzheimer’s Society and, with their support and promotion among their service users, a community has grown and members regularly attend sessions. In similar vein, Library Memory groups won a Wiltshire Public Health award in 2016, for improving mental health and wellbeing. Their project - a collaboration between The Reader Organisation, Wiltshire Council and Wiltshire Clinical Commissioning Group - runs in libraries to bring the shared reading experience to people living with dementia and memory loss on a weekly basis. Westminster, Kensington and Hammersmith Libraries have created a dedicated twitter account to alert their followers to health related activities in their libraries: https://twitter.com/wellbeinginlibs. It would be interesting to hear if any other library services are using social media to reach out to specific groups in their communities. 2013 was clearly a good year for health programmes; not only did Kent get a Libraries Change Lives award for their dementia awareness programme, but Kirklees were one of the other finalists for their programme: Reading and You. This was about using bibliotherapy - that is, the use of fiction and poetry to support and increase positive outcomes for people with mental health and wellbeing issues. Reading and You works in libraries, hospitals and community organisation's premises to highlight the value of reading and libraries to inspire and engage with those who may be difficult to reach due to mental ill health. They help those suffering from depression, bipolar disorder, psychoses such as schizophrenia, dementia and people with drug and alcohol addiction. Alongside dedicated programmes, there are also many libraries where health-related activities take place - whether health checks for mothers and babies, blood pressure monitoring, or support groups for people with particular conditions, partner organisations find that libraries are a welcoming and trusted space that members of the community are happy to visit. The Guardian has published a couple of articles that highlight health-related work and new partnerships: NHS partners up with libraries to boost wellbeing (we published a case study on this new partnership between South Staffordshire and Shropshire NHS Foundation Trust and Staffordshire County Council), and The libraries that offer sexual health services and cancer support about a programme in Coventry. The Network has also taken an interest and published a set of material illustrating health projects. An increasing number of libraries are sharing premises with medical centres or doctors surgeries. Any co-location seeks to build on the number of activities that people are likely to want to do at the same or similar time, and while in previous posts we have spoken about libraries co-locating with cultural institutions such as museums and galleries, there are also co-locations involving libraries and places where people go for health purposes - whether medical/clinical, or preventative - such as leisure centres. Later this week, we’ll publish a short post on a very specific programme that illustrates several of the outcomes showcased in this series: communities, learning, and health and wellbeing. Its about a colourful item that community groups are producing which has practical uses among those suffering from particular conditions. Norfolk Libraries: On a countywide drive to actively promote healthier living, staff at all 47 of Norfolk’s libraries have been trained in understanding health improvement and mental health first aid to offer information, advice and guidance on local health services - signposting to suitable local health projects’. Dedicated awareness activities at Norfolk Healthy Libraries include slipper swaps targeting fall prevention and a smoothie bike aimed at raising awareness of the benefits of the government-recommended target of five a day fruit and vegetable portions. Sefton Library Service goes out into homes and care homes to record the life stories of local people in the first stages of memory loss, to provide a reminiscence tool for the patient’s care and a valuable primary history. The work is delivered in partnership with the Alzheimer’s Society, Age Concern, Age UK and care homes in the Sefton Area, who refer people recently diagnosed with memory loss. Residential care workers are using the material to establish a rapport with their residents and find topics of conversation. Memories recorded include wartime experiences, accounts of childhood times, and family and working lives spent in what is now the Sefton district of Merseyside. The recordings are accessible to the public via the local history archive at Crosby Library. Next week will be our final post in this series, and we’ll share how libraries contribute to helping everyone achieve their full potential. "Library teams are the filter through which Healthy Library activity has happened. Library staff, customers and volunteers have been able to enter at any level they choose and tailor what happens in their Healthy Library, to the local community. So if customers express an interest in walking for their health, or there is an obvious need for a friendship group, then a very small amount of money for staffing, materials and refreshments can make those things happen. We have found that the rest will then follow - people and partners want to get involved, supermarkets will donate fruit and veg for the smoothie bike activities, a tremendous amount of goodwill is generated and we can make sure that all sorts of health messages are embedded. As we know, these are important for our staff as well as for our customers. The £4,000 we have won will help us to take the next steps. Libraries have always done an amazing amount on a shoestring but this will help us make much more happen because it means that we can open it up for staff to bid for amounts of money from it. Bidding for small pots of money has proved to be a very successful way of engaging people in the past year. We will continue to work with the Public Health team in Norfolk as well as doctors surgeries to continue to embed the Universal Health Offer in all our libraries. This is now no longer a project but part of our mainstream service and I think for many of our staff a real mission."